The use of PVC for the production of pipes and related products is one of the most dramatic success stories of this century. This material can fulfill the basic need of providing clean water. Traditional material such as steel, cast iron and concrete suffer from problems of corrosion, cost, transportation and a short uncertain life span. None of these problems are associated with u-PVC pipes. 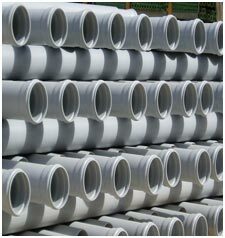 Dadex is currently producing u-PVC pipes for Soil, Waste & Vent (Nikasi), Tube Wells, Sewer Pipe System (Flowline) and for Water Supply & Distribution.